Unless you've been living under a cave then you'll know that velvet is EVERYWHERE this season. From tailoring to party wear, velvet has taken the fashion world by storm. Until now, I've never been overly keen on velvet. I've always loved the soft texture but it was always reminiscent of an awful cap sleeved dress I was once made to wear one Christmas as a child. I think I've only just got over the ordeal to be honest. With that said I am totally buying into the velvet trend this season and as a huge fan of tailoring, I couldn't wait to share this suit with you just in time for the party season. Don't want to worry about lugging a party outfit into work with you for office drinks or the eagerly anticipated Christmas party? Now you don't have to. Just swap your trainers for heels and a bold lip and you're good to go. That way you won't look like you've tried too hard either. You really will be taking effortless to a whole new level and everyone loves a touch of effortless chic. 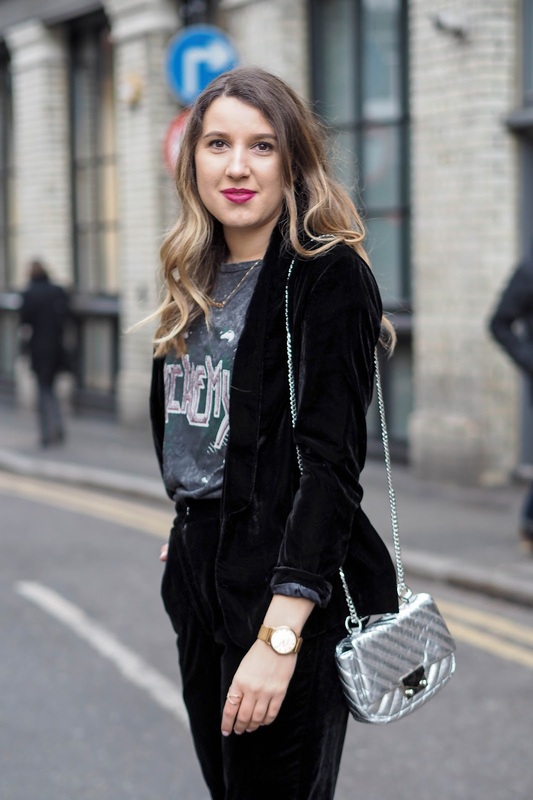 The glittery ankle socks and metallic bag definitely take this velvet suit from daytime attire to more of a party look. 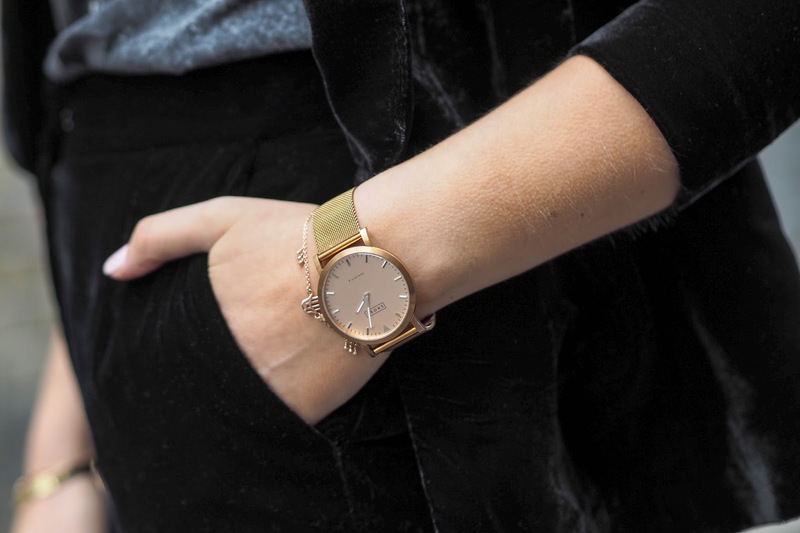 All you need is a little accessorising and you've pretty much got yourself a completely new outfit altogether. The best part is after your Christmas party is over you can get lots of wear out of your velvet separates. After all it doesn't look like velvet is going anywhere, anytime soon. All you'll need is a little touch up of makeup and a bright lip (I'm wearing Rebel by Mac) and the night is truly what you make it. 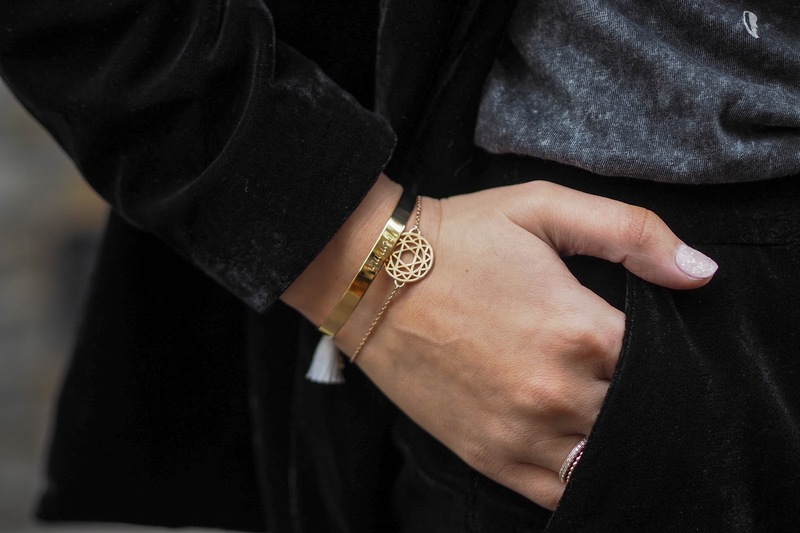 Have any of you bought into velvet this season? I would love to know. FANTASTIC styling in both ways ! Can't even pick a favourite. The dress up version is so chic ! I'm SO tempted to get a velvet suit and you may have just convinced me. This is gorgeous! I am loving velvet at the moment and also the socks and shoes look - i just got a little spendy on ASOS and grabbed me some cute pairs! You've nailed the styling here.